Home » Electrical Outlet » Lower your electricity bill – what do appliances use? Lower your electricity bill – what do appliances use? There are countless reasons to lower your electricity bill! The obvious one is for you to save money each month on utility bills. It’s also a good thing because more than ever, going “green” can have impacts on our planet. Most of us are probably aware of the simple ways to save electric costs at home, such as turning off your computer when not in use, using lower-wattage or energy-efficient light bulbs, or using gas appliances when possible. In the end though, some well-known habits and simple changes around the house may not make as big of difference as you’d like, and you think “how else can I lower my electric bill?” And that’s why you’re reading an article like this. So, let’s take a look at a lesser-known, easy to do method for lowering electricity bills: Finding out appliance electricity usage in your home. Yes, just knowing what things run can have significant impacts! We all know that the real power hogs in your house are appliances like TVs, refrigerators, freezers, dryers and computers. Sure, many modern appliance models today come with energy-efficient features and are designed as such. This is important, and does help. What’s more important though is how you use these electrical appliances; your behavior in running and using them day-to-day and over the weeks and months. Compounded over time, small changes to appliances electrical usage can add up to huge savings. If someone asked you how much electricity does your computer (PC) use, would you know? And even if you did, could you translate that into how much money it costs to run each month? If you told that person your computer was on 24 hours a day, and they told you that if you just turned it off for half of the day it would save you $5.00 a month, what would you do? I think we would all agree on the answer! And that’s with just one appliance. The point here is that you need a way to find out how much energy your appliances are really using so that you can make informed decisions on how or when to use them (certain hours of the day in summer for example), or even if it’s worth upgrading an appliance based on it’s electricity use. 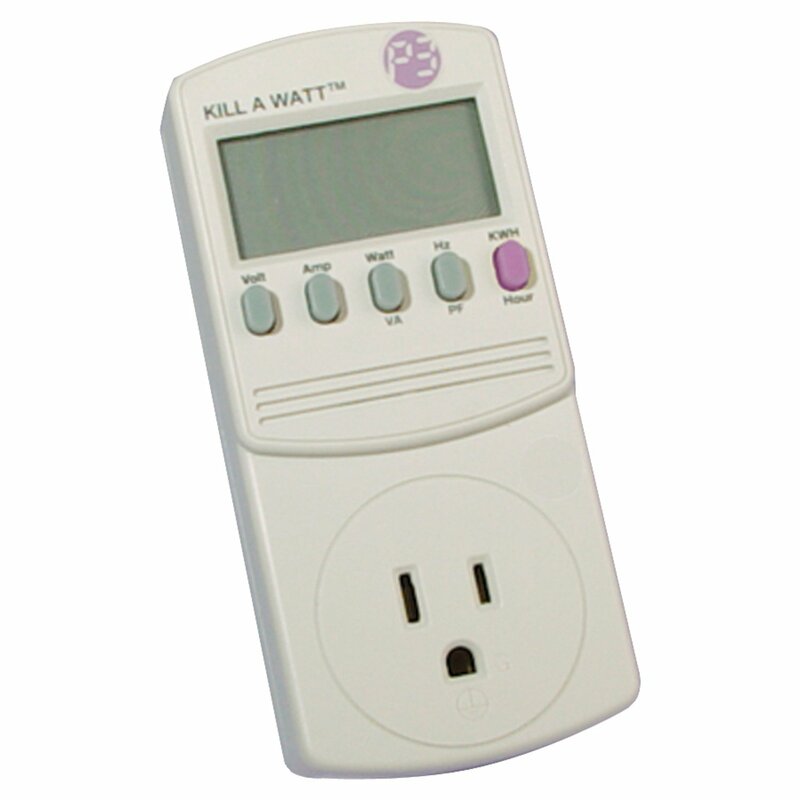 By far the easiest way to get this info in YOUR home and with your specific appliances is with a little device called an electricity usage monitor. Yes, it sounds as simple as it is. Want to find out how much your old refrigerator in the garage costs to run each month? Easy, plug it in to the monitor and the digital display will give you a reading. The highly accurate reading can tell you not just electrical use for an appliance, but can convert that to actual dollars per day/week/month. Instantly you’re in the know! Suddenly you have a dollar mount to put to leaving your TV on while you play just the music station on the cable box (DVR) or running a fan on high instead of the low setting, or leaving your VCR on standby. You’re in charge of your eclectic bill more than ever. The best and most popular monitor today is the one shown at the right. At only $20, it has the potential to pay for itself in the first month! Check out the reviews at Amazon – it’s a very neat little gadget. They say that 20% of your electric bill amount is due to devices that are left plugged in, but not in use. Like a cell phone charger, treadmill and even a TV. They all drawer power even when they’re OFF. Not convinced the electricity they use isn’t much to care about? Just plug them into the monitor and see for yourself. Add these up, and you’ll see how to lower electrical usage in your home immediately. Since it can be a pain to unplug some of the bigger appliances, they make a nifty gadget called “Bye Bye Standby” – you simply plug your appliance into that, then that into the wall. With a flick of a switch (remote control) you can cut electricity completely to your appliance and stop the needless draw. think about that when you want to lower your summer electric bill! comment and let others know!